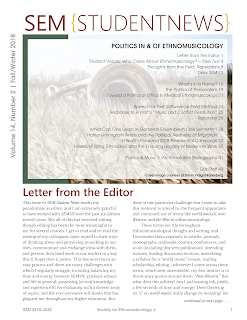 SEM Student News is a biannual publication of the Society for Ethnomusicology, created and run by students. 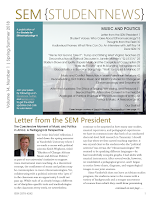 In cooperation with the SEM Student Union, we aim to voice current student issues and ideas, and to provide useful, relevant information for students conducting research on musicking. Most of all, we provide a forum for students to communicate with their peers and to address the challenges and opportunities that we face together.